There are two kinds of matte liquid lipsticks in the world. The drying, "flat" kind, and the non-drying, lightweight kind. Recently, I have been exploring the latter category, and have a bunch of finds to show you - after having tried 40 different brands so far. By Terry's Terrybly Velvet Rouge Intense Matte Liquid Lipstick is one of them. I picked just the two shades - Cappuccino Rose and Dream Bloom. I also have Baba Bloom on the way, which I'll swatch and update here, once I get it. Scroll down for the review and swatches of By Terry Terrybly Velvet Rouge Liquid Lipsticks in Cappuccino Rose and Dream Bloom. Let's talk about the packaging for a minute. The lid in particular is beautiful, with By Terry's logo printed in square patterns. The tube comes in By Terry's signature violet and silver box. These only contain 2ml product, as opposed to, say, Huda Beauty Lip Mattes, reviewed here, which contain 6ml product. The applicator is hourglass-shaped. It picks up just the right quantity of product and glides nicely over the lip contours. Sometimes, I have to wipe off some from the edges, but then I'm a klutz. Formula-wise, these are described as "ultra-comforting", and "intense matte". I agree with the first one and disagree with the second. The By Terry Terrybly Velvet Rouge Liquid Lipsticks are definitely ultra-comforting. They do not dry out at all. Intense matte? No. Satin matte, yes. Intense dry mattes a la Jeffree Star or ABH? No. Coverage is 100 per cent in one swipe. You don't have to work the applicator to and fro, as you have to with other liquid lipsticks - these glide on nicely. There IS some transfer initially, but you don't lose any coverage as such. To avoid this transfer, you have to blot with a tissue paper after application. These last through drinks and sandwiches, with a stain on the glass, but do not remain untouched through a hot meal. There will be an even stain of colour afterwards, yes, but not the intense coverage you begin with. The price you have to pay for the "comfort matte" finish. Cappuccino Rose is a 1990s brown with mauve undertones, while Dream Bloom is a light-medium bright pink - the kind of shade that borders on the paler side for my skintone. It will be gorgeous on anyone below, say, NC30, but I think the olive in my skin doesn't go well with this sort of pink. Cappuccino Rose, on the other hand, is my kind of shade. Not dusty rose, but definitely a neutral brown with enough plummy mauve to bring in some interest. Here are swatches - Dream Bloom is above while Cappuccino Rose is below. The photo was taken in direct sunlight, after the swatches "dried", so you can see the finish is more satin than matte. On-lips swatches. See the satin effect? Not a fan of those drying matte liquid lipsticks? Go buy. These are satin mattes. NOT intense mattes. I love the velvet finish more than the flat effect some of those matte liquid lippies have. A fan of Bourjois Rouge Edition Velvet (reviewed here)? These are high-end, more even versions that non-drying satin formula. Huda Beauty Lip Mattes (reviewed here) or these? Tough. Huda has more staying power and is comparatively drier than these, though Huda is a far cry from those flat-dry finishes. I'd put Huda ahead by a whisker. A fan of luxurious lipsticks? You need these in your arsenal. At $46 or £30 a pop, it doesn't get a lot more high-end than this. 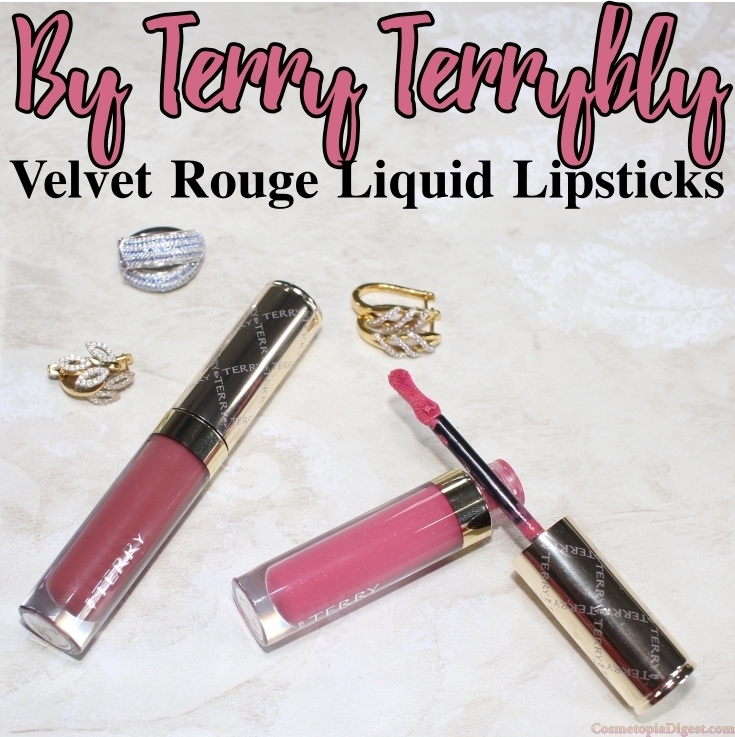 Buy the By Terry Terrybly Velvet Rouge Liquid Lipsticks here - they ship worldwide tracked. Or buy from Nordies here, or here if you live in the US.